It’s National Childhood Obesity Awareness Month! Start teaching your kids healthy habits early by spending time each day getting active with them. This can set your kids up for a healthier life in the long run. 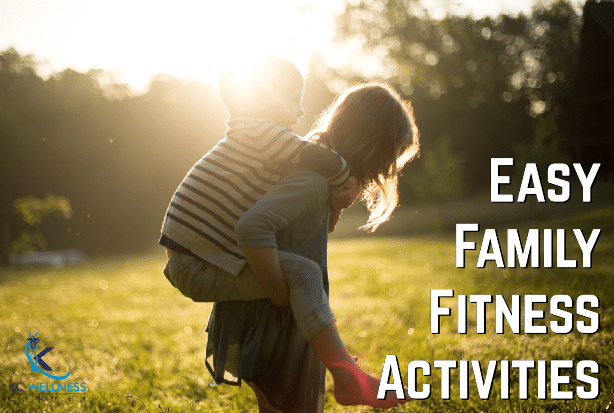 Getting the kids active may seem like a challenge after the family has had a hard day, and it’s even harder to meet your own personal fitness goals when you have other priorities. The American Heart Association recommends that adults get at least 30 minutes of physical activity a day to keep a healthy heart, but that time is increased for kids. According to Build Healthy Kids, preschoolers, children and adolescents should get at least 60 minutes of moderate to vigorous physical activity per day. You can work on your weight loss goals while also getting your kids their much-needed exercise by getting active together. Here are a few tips from Parents.com. Make a habit of finishing your day with quality family time in the outdoors. Find a park trail that you enjoy or just take a lap around the neighborhood. This lets kids get a little energy out before bedtime and allows the whole family to enjoy the evening together even longer. Chores don’t have to be such a drag. Dance breaks, timed races and “the floor is lava” games are all great ways to make chores a little more enjoyable for kids. Move around during TV commercials. Turn the two-minute breaks during your kids’ favorite shows into fitness time! Guide them through simple workouts and give them fun names. Try new sports every week. Have a designated day of the week when your kids are able to get their hands on a new type of sport or activity. This could be soccer, swimming, yoga — you name it. They will have fun learning something new and might even find a new hobby they love! If you live close to your child’s school, walk with them there and back every day! If you’re close to a park that you like to go to, try to walk instead of drive. It’s a sneaky way to incorporate more steps into your days. Taking the time to do these fun activities with your kids can ensure that you get your own daily fitness in. That, coupled with a healthy diet, will send you on the right track to healthy weight loss. If you want to become more committed to your weight loss goals, schedule a consultation with us for medical weight loss: https://bit.ly/2NCVgxr. Posted in Uncategorized and tagged Childhood Obesity, Children, Chores, Exercise, Family, Family fun, Fitness, Fun, Low-impact, Running, sports, Walking, Weight Loss.